In 2010, Karanto celebrated 100 years of grape growing. In 1910, Percival (PR) Dodd settled on a 50 Ha property south of Langhorne Creek on the western edge of the Bremer River flood plain and named it Karanto. In April of that year, he married Winifred White of Milang and later built a cottage on the property. Over the next 50 years, Karanto was developed into a mixed horticultural enterprise. Grapes were grown both for table and fortified wines and for drying as sultanas and currants. 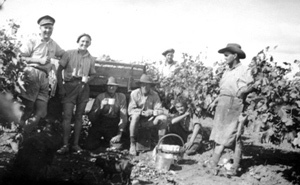 Fruits such as apricots, peaches, plums and figs were produced and sold fresh to local residents and sent to jam makers, such as Glen Ewin in the Adelaide Hills. Small quantities of almonds were also produced. When the Riverland fruit industries were developed the production of fruits declined and a dairy was started and lucerne was grown. PR and Winnie had six children, Eugeena, Edric, Ian, Lynette, Mervyn and Ronald, and two sons Edric and Ian worked on Karanto with PR. They took over the reins in the 1960's and continued with grape growing and dairying until the mid 1970's when the dairy was phased out and grape growing became their major enterprise. In 1979 Karanto passed to the third generation when PR's grand daughter Zonda and her husband Dennis Elliott began managing the property. Karanto is now focussed almost exclusively on producing super premium shiraz and cabernet for major wine companies and experimenting with Italian varieties, Aglianico, Fiano, Greco di Tufo, Pinot Grigio and Primitivo.